In the ancient Middle Eastern culture that the Bible takes place in, family was everything. The style of living was a tribal society with a patriarch as the head of each tribe. Your status in life was determined by who your father was and what family, tribe, or clan you were from. The family was a deciding factor in every decision of life. Heritage was very important and everything possible was done to keep your connection to the family members and the family plot of land. A great example of this is the story of Joseph’s bones found first in the Book of Genesis 50:24-25. Joseph, like his father Jacob (Genesis 49:29-32 and Genesis 50:12-14), requested that when he died he did not want his bones left in Egypt, but taken back to his father’s land (Genesis 50:24-25). The Text says that when Joseph died, his body was embalmed (in the Egyptian custom) and was placed in a coffin in Egypt. More than two hundred years would pass after Joseph’s death until the time of the Exodus. At the climax of the ten plagues, the Israelites are released to leave Egypt and head out into the desert for the Promised Land. When the Israelites left Egypt, Moses evidently picked up Joseph’s bones to take with them on the journey (Exodus 13:19). While the rest of the Israelites were plundering the Egyptians, Moses had the foresight to disinter Joseph’s bones out of the coffin and tomb (pyramid) they were in to keep the promise that had been made to Joseph by the family. Joseph’s bones were not actually buried in the Promised Land until the time of Joshua, 150-200 years later (Joshua 24:32). 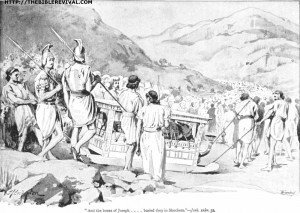 His bones were finally buried at Shechem on the land that his father Jacob had purchased hundreds of years earlier (Genesis 33:18-20). Shechem then became the center of the tribes of Ephraim and Manasseh, the two sons of Joesph. This would be the place where they would settle and live in the Promised Land. This interesting story, played out over a 350-400 year period, shows how strong the concept of heritage was in their society. Everything centered around the patriarch of the family and the family land and a tremendous amount of effort went into being able to keep the faith with their forefathers. Because of this diligence, Joseph’s children also settled on the inherited property and the family was held intact for many more generations. On our last trip to Israel we learned a very rich word in Hebrew, a new concept, that really impacted us and gave us a deeper understanding of what our mission as believers in Jesus should look like. The word in Hebrew is m’sharet (mesharet) and is translated in English as assistant or aide. However, this word, as it related to the Hebrew culture of that day, went much deeper than a single word in English could capture. If you look up the word in the Hebrew concordance, (Strong’s 8334), it is defined as, “to minister, to serve as an attendant, to wait upon someone as a squire waits on a knight.” It is used to describe someone who believes so passionately in their master’s mission that they would do any task or anything to assist in what their master was doing. 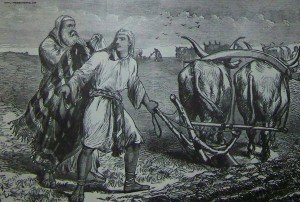 A m’sharet went everywhere with their master and did all the manual labor and the menial tasks in order to help their master through the day and served as an apprentice to him. The word is used in the Hebrew Testament in Exodus 24:13 to describe this relationship between Moses and Joshua. 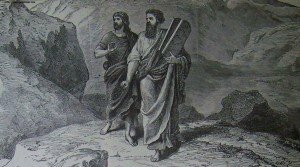 In this set of verses, Moses takes his m’sharet, Joshua,and takes him up Mt. Sinai with him to meet God. Although the text doesn’t specifically say it, the implication is that Joshua was the porter for the trip up the mountain. Exodus 33:11 again calls Joshua Moses’ attendant and says that Moses used him to guard the tent of meeting. Previously, in Exodus 17:9 Moses orders Joshua, his right hand man, to fight the Amalekites. In Deuteronomy 1:38 God tells Moses to encourage his assistant Joshua and teach him what he knows, because Joshua will eventually become the new leader of all Israel. Numbers 11:28 says that Joshua had been Moses’ aide since his youth. Later, in Joshua 1:3 and 3:7, after the death of Moses, the Lord speaks to Joshua and identifies him as Moses attendant (mesharet Moshe). Because of this relationship with Moses, God makes Joshua the new leader and charges him with taking the Israelites across the Jordan into the land that they had been promised. The sages from early times, in discussing this passage, noted that God called Joshua “m’sharet” instead of “talmid” (disciple), for a reason. Joshua wasn’t a great leader because he knew his Torah, but because he had been with Moses and had watched him in action for all those years. He learned from Moses experiences and had practiced the art of leadership before he had to use it. He had carried Moses pack, he had waited on him hand and foot, slept and ate in the same tent, and had even gone to battle for him. He had done his apprenticeship directly under the eyes of the master. As another example, 1 Kings 19:21 says,”Then he (Elisha) set out to follow Elijah and became his attendant (m’sharet).” In this story in 1 Kings, Elisha said goodbye to his comfortable home and well off family to become Elijah’s personal servant. Again, the word m’sharet is used instead of talmid. He was his apprentice, his servant. Later in 2 Kings 3:11, Elisha is identified as a prophet and someone worthy for King Jeshophat to talk to by describing him as “the one who used to pour water on Elijah’s hand“ (he waited on him). Again, the sages noted that what qualified Elisha was not that he was book smart but that he served (his master). There are many other examples of m’sharet in scripture. Elsiha also had a mesharet (2 Kings 4:43 and 6:15). Samuel was Eli’s m’sharet (1 Samuel 2:11). The point is that certain educational experiences can only be learned through apprenticeship. Book knowledge is insufficient. It is necessary to learn by practicing, getting your hands dirty, and learning directly under the eyes of the master. What about the New Testament? Did Jesus have m’sharet? If you will think about it, Jesus never rowed the boat, carried his pack, kept up with the money, prepared the upper room, went in to town to buy food, or took care of feeding his followers. The disciples did all the menial work! They believed so passionately in his mission that they were willing to do anything and go anywhere just to be in his company and in on the action. They were anxious to show him that they believed in his mission. They didn’t just sit around and discuss the scriptures as his peers, they were apprentices in every phase of life. Should we be thinking more of ourselves as Jesus’ m’sharet than just his student or convert? Much of the emphasis in modern Christianity is focused on “me”; my walk, my happiness, my quiet time. We really buy into the cross and the fact that Jesus saved us, but we are not as anxious to buy into the mission and the hard work it requires. It is definitely not our mission just to be saved and the mission is really not about us. Do you buy into the mission to do whatever it takes to model and please the rabbi? Are you willing to do the hard and sometimes menial work that is required to be an attendant? The word mission implies a journey and every journey requires effort. Jesus is looking for some m’sharet to follow him and learn from him on the journey. Are you willing to buy in as his attendant? P.S. Another example of m’sharet in the New Testament would be Timothy to Paul.